Square Enix has detailed a massive list of future Final Fantasy XIV improvements, including a new job system and a battle with the Ifrit. Final Fantasy XIV didn't launch on the best of terms with its playerbase due to various bugs and frustrating gameplay mechanics, causing Square Enix to nix subscription fees until the game could be brought up to speed. Instead of just talking about it, Square recently detailed a huge list of specific improvements that it hopes will bring fans back to the game. To start off, Square is revamping the battle system to "reward effort" and "reduce monotony." It's working on an auto-attack system that'll move battles along with player sanity intact. Square aims for the revisions to cater to both to solo and party play. In addition, quests will be revised to center on rewards, the crafting system is being expanded with tweaks and new recipies, Materia crafting is being added, the user interface will undergo changes, players will be able to acquire in-game achievements, new modes of transport are in the works, and Square is adding a "shiny new job system." Square says the job system is a "proper system," and not just "renamed classes." In regards to transport, the company is giving chocobos "a lot of thought." All of that is well and good, but mechanics mean nothing if there isn't anything fun or epic to do in the game. 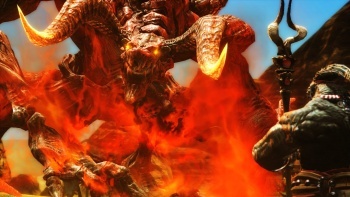 To that end, Square has revealed: "The long-awaited battle with the primal Ifrit is on the way!" Ifrit is known in the Final Fantasy series as a popular fire-based summon. Further, Square says that more primal battles will be added in the future. Seriously, Square Enix appears to be working really hard at making Final Fantasy XIV better. There's a whole grid of changes and their progress here. I didn't think I'd take another look at the game after having mediocre experience with it at launch, but with changes such as these I might change my mind.